Adjust oven rack to lower-middle position and preheat oven to 275 degrees. Combine 3/4 cup of the cream, the white sugar and the pinch of salt in a medium saucepan. Halve the vanilla bean lengthwise and scrape all the seeds into the cream. Then put the bean itself in as well. Heat the cream to a boil, stirring occasionally, cover and remove from heat. Leave to steep for 15 minutes. Meanwhile, put a kettle on to boil with enough water to fill a 9 x 13 dish halfway. Now, take a 9x 13 baking dish, line with a small towel and place ramekins on top of towel. After cream has steeped, add remaining 3/4 cup cream to cool down mixture. Whisk yolks in a medium bowl until broken up and combined. Whisk in about 1/2 cup of cream mixture to loosen up yolks, then repeat with another 1/2 cup and then the rest of the cream. You want to warm the yolks slowly so they don’t cook. Strain mixture through a fine-mesh strainer into a measuring cup or pitcher and then pour carefully into the ramekins, dividing evenly. Put baking dish with ramekins on oven rack and carefully pour boiling water in baking dish until it comes about 1/2 -2/3 up the sides of the ramekins. Be careful not to splash any water on your custard. Bake custards until just set. I use an instant read thermometer and wait until the centers of the custards reach between 175 and no more than 180 degrees. This should take about 30-40 minutes depending on your oven, so begin checking at 25 minutes and then in 5-10 minute intervals after that. Remove from oven and then remove ramekins to a rack to cool, at least 2 hours. Then cover and refrigerate at least another 4 hours and as long as 4 -5 days before serving. 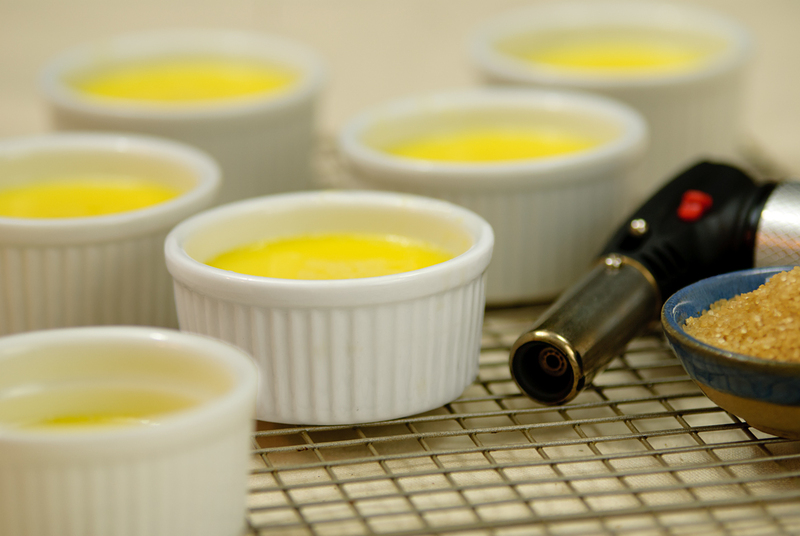 When ready to serve, sprinkle the top of each custard with 1-2 tsps of the turbinado sugar and shake ramekin to spread evenly. Use your torch to melt and caramelize the sugar. Most recipes recommend that you then refrigerate again for 30 minutes or so, but I’ve never done this and I’ve had no complaints yet. I like to serve with a garnish of fresh raspberry, pear or whatever fruit happens to be in season. This entry was posted in desserts and tagged cream brulee, make ahead desserts, vanilla.